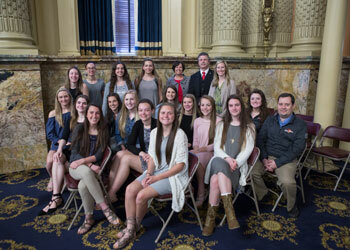 HARRISBURG – Today, Reps. David Maloney (R-Berks) and Marcy Toepel (R-Montgomery) presented House citations to each member of this year’s PIAA State Class 6A Girls’ Basketball Championship Team —The Boyertown High School Bears. Toepel and Maloney, both graduates of Boyertown High School, praised the team on its amazing season to the applause of the entire House chamber. On Friday, March 24, the Lady Bears capped off their championship season with a 46-35 win over North Allegheny High School in the Class 6A final for the second state title for the school in just 10 months. The boy’s baseball team grabbed the state 4A title in June. Also earning state honors this week was team coach Jason Bieber, who was named Class 6A Coach of the Year for his outstanding leadership of the team.